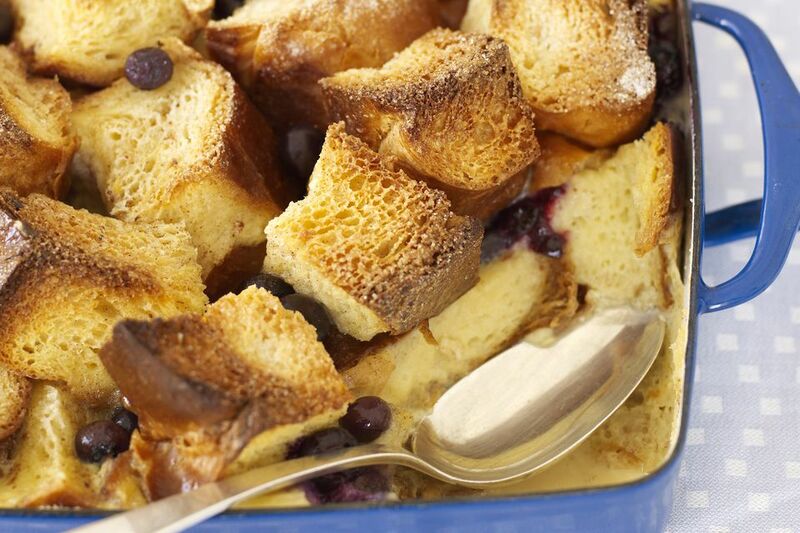 This is a rich and delicious French toast bake with cream cheese, fresh blueberries, and a blueberry sauce. Plan to prepare this the night before and refrigerate overnight. Cut the bread into 1-inch cubes and place half in a greased 13x9x2-inch baking dish. Cut cream cheese into 1-inch cubes and place over bread. Top with blueberries and remaining bread. Whisk in milk and syrup, blending well. Pour egg mixture over bread mixture. Cover and chill 8 hours or overnight. Remove from refrigerator 30 minutes before baking. Cover with foil and bake at 350 F for 30 minutes. Uncover; bake 25 to 30 minutes longer or until golden brown and the center is set. In a saucepan, combine sugar and cornstarch; add water. Bring to a boil over medium heat; boil for 3 minutes, stirring constantly. Stir in blueberries; reduce heat. Simmer for 8 to 10 minutes, or until the berries have burst. Serve the sauce with French toast.